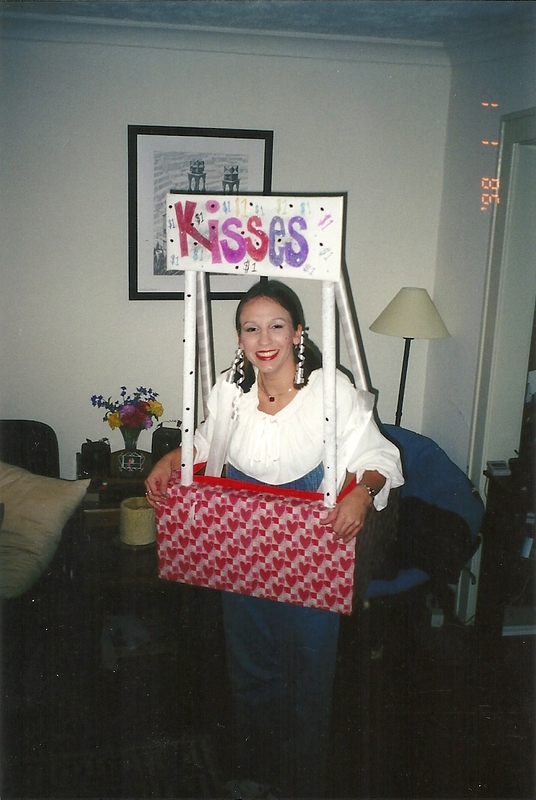 Did it ever occur to you to make your own Halloween costume this year? I mean, those awesome Princess Leia costumes can cost you a pretty penny not to mention the imminent wardrobe malfunction that should follow. So why not put your wallet away and try this costume on for size? This costume idea will cost you next to nothing to make and what’s even better is, you can make money at your party with it. I made enough money in this costume to buy a tank of gas for my gas guzzling 76 Chevy Nova. I’m sure with a larger party than what I went to, you could make much more money than I did. A large box that is big enough to go around your mid section. 2 White ribbons, at least 3″ wide and each long enough to go over your shoulders and still secure down to the underside of the front flap and the back flap. Cut the flaps of the box so that there is about 3″ left of each flap. Gift wrap the box on the outside to include the 3″ flaps using clear tape. Cut 2 holes in the front flap and 2 in the back flap on each end. Gift wrap tubes should fit tight into the holes. Split the bottom of the gift wrap tubes so that once they are through the holes made in Step 3, you can fan them out on the underside of the flaps and tape them down. Insert the tubes through the holes, fan them out as indicated in Step 4 and tape them down. Secure one end of the 2 white ribbons to the front flap, just less than shoulder length apart. Do this to the back flap with the other end of the ribbon. Remember this ribbon will have to hold up the box on your body otherwise you’re going to be holding it up yourself all night. 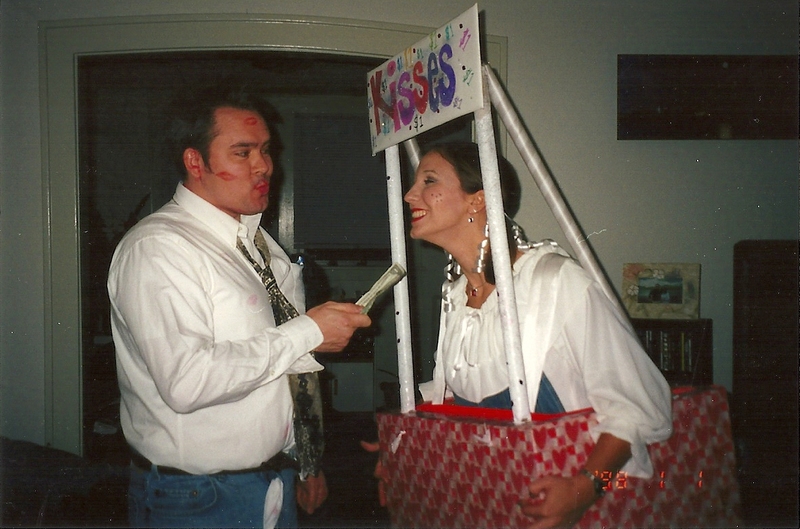 Decorate the flat piece of cardboard with white paper and write Kissing Booth and name your price. Tape your Kissing Booth sign to the gift wrap tubes using duct tape, bending the ones in the back to meet the ones in the front. Shimmy yourself into your kissing booth and go to town. Have a fabulous night, take pictures and share them with me! I’d love to see you in your costumes!